Size of the Industry In the year 2003-04 the exports of this sector increased by 16.8 % and crossed a level of US$10.5 billion. India has a glorious history which affects each and every aspect of Indian lifestyle. Jewellery has always remained an integral part of the Indian lifestyle. The diverse history of India has great influence on the jewellery styles as well. Indian jewellery history goes back to almost 5000 years. Ever since pre-historic times India people had a penchant for adorning themselves with Jewellery especially women. Gold, silver, stones, gems, etc. are the defining aspects of Indian jewellery. 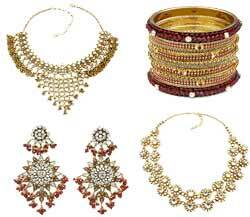 Indian jewellery industry is much varied in styles and designs in accordance to the different regions. Indian jewellery has the unique design to the state and are not found anywhere else in the world. For example the delicate filigree work in silver which is unique to Odisha and Andhra Pradesh; Rajasthan is popular for Meenakari (jewellery enameling work). In south, the temple town of Nagercoil is famous for temple jewellery; Kundan jewellery is famous in Delhi. Indian Jewellery Industry has a variety of ornaments in different styles and designs for every part of the body. In ancient times, people used to adorn themselves with variety of necklaces, rings, anklets made of crude stones and other metals. As time has gone people learnt the art of polishing metals like gold and silver and learnt to extract semi-precious stones and gems from the mines. Even during ruling empires the rich kings wore jewellery that made them look like Gods. Every big and small piece of adornment was made of gold and precious stones like rings, earrings, bangles, chains, crowns, anklets, etc. For past many years India has been ruled by different empires. All these empires have left an incredible mark on the jewellery styles. The Mughals had their own distinctive style of using precious stones and intricate carvings, the Rajputs had their enameled jewellery and so on. In today's modern world though many new and sophisticated styles have emerged to urban centers, the traditional style of jewellery is in vogue and is usually the first choice in jewellery. In the contemporary Indian market one would find beautiful blend of traditional and modern jewellery in gold and silver that are decorated with gorgeous precious stones that always attract and amuse buyers. 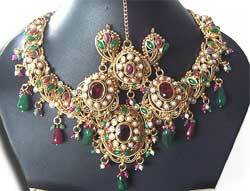 Indian jewellery and Indian women are the terms always linked inherently. In India during wedding as well as numerous other occasions, a woman is gifted jewellery by her parents and relatives. Although such gifts are meant to give her security in contingency, ornamentation is an obvious purpose. All the cities across the length and width of India have outlets of jewellers were some are traditional and some are modern jewellers, catering to the need of all kinds of customers. Indian houses have various kinds of jewellery arts ranging from Meenakari and Kundan to stone & bead work. The craft of cutting and polishing precious & semi-precious stones give them glamorous face whihc is artistic. Emeralds, rubies, garnets, amethysts, corals, sapphires, and turquoises are stones which are used for the enhancement of gold and silver jewellery. In south India, women are most known for Gold jewellery. South Indian gold is considered auspicious as a status symbol. The jewellery which was developed years past is known by the name of 'Antique jewellery.' This has jewellery with dull and rough look, combined with an old world-world charm, and this serves as the major USP of such jewellery. Bead art in India is 5000 years old and was during the time of Indus Valley Civilization. The Indian Jewellery Industry is growing with a whopping rate & boom in the domestic and exports of Indian jewellery, these shining materials of India brings more sparkle to the economy. Exports of Gems and jewellery make India the second major foreign exchange earner for the country. As more money is flowing into the industry, a new avenue is open for professionals to enter the field with changing taste and the jewel is taking new shapes and charm. Custom jewellery which is personalized jewellery. Jewellery that is made from the tusk of an elephant is called ivory jewellery. Jadau jewellery forms are good examples for high skilled craftsmanship of Mughals. The art of kundan work reached Rajasthan from Delhi. Lac Jewellery is also called as lacquer jewellery which has its origin in Rajasthan and has gained considerable popularity in India. Meenakari Jewellery are precious stones which are set with gold. Navratna Jewellery has nine auspicious stones which are used in a single ornament together to ensure well being of the person who wears it. Pachchikam Jewellery for craft is good example of jewellery that has come back once again. 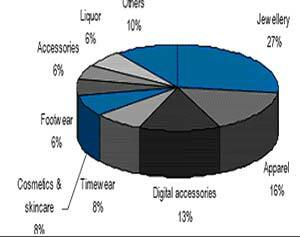 Indian jewellery is valued at Rs.70000 crore in the year 2007. It is anticipated to grow at a rate of 8% by 2009-10. The CAGR amounts around 14% from 2007-08 to 2010-11. India remains the world's largest gold consumer. In the year 2003-04 the exports of this sector increased by 16.8% and crossed a level of US$10.5 billion. An interesting industry from an Indian standpoint, it involves imported raw materials, domestic value added, and global markets and provides skilled employment. Jobs in Indian jewellery industry are growing as there are new avenues for training and development, skill enhancement in jewellery design and production. The institutions offering training in gemology and jewellery designing are many in the country like the National Institute of Fashion Technology (NIFT) have opened many training centers across India which is imparting training to professionals for a glittering career. As there is an increase in jewellery exports, more national and international companies in the field are setting up new centers in India and recruiting trained professionals to keep the pace with growing international market. A trained gemologist or jewellery designer in India can find attractive job and sparkling career abroad. The industry is growing at a rate between 8-10% and is expected to grow much more. Though China and Thailand are slowly increasing their manufacturer of jewellery Indian exports are strong, major markets being USA, Canada, parts of Europe. The Indian Jewellry industry will be relieved if the tax structure is simplified and as the gold prices are heading north the expectations are more bullish movements in the stock market. India consumes around 800 tonnes of gold that account for 20% of global gold consumption and nearly 600 tonnes is used in jewellery making in the country. According to the study of KPMG the Indian Jewelery Industry is estimated to be US$ 13.5 billion in fiscal 2006-07, accounts for 8.3 % of the global jewelery sales. In the year 2006-2007 the xports from Indian Jewellry Industry yielded US$ 17.1 billion which was against US$ 16.64 billion in 2005-06 with a growth of 26%. Today the diamonds accounted for 64 % of the total exports, gold jewelery accounts for 30.47 %, colored gem stones and others accounted for 1.44 % and 1.04 % respectively. In the year 2006-2007 due to the increase in purchasing parity of the middle class and surging income levels resulted in consumption growth of gems and jewellry for about 11% in the 5 years. The Industry also contributes over 15% of the total exports of country and provides employment to 1.3 million people directly and indirectly. The contribution of gold jewellery is about 80% of the total jewellery market, with the balance comprising fabricated studded jewellery, which includes diamonds as well as gemstone studded jewellery. Indian jewellery Industry is supported by Government policies and the banking sector, with around 50 banks providing about US$ 3 billion credit to the Indian diamond industry.